President Donald Trump's former lawyer Michael Cohen is suing the Trump Organization, arguing it owes him millions in legal fees and costs. The company is allegedly reneging on a payment deal after Cohen cooperated with investigations into its business. He has given evidence to Special Counsel Robert Mueller's investigation into alleged Russian involvement in the 2016 US presidential election. Cohen says the costs total about $1.9 million (£1.45m) and are still growing. The lawsuit says the group should pay the roughly $1.9m Cohen has been ordered to pay as part of his criminal sentence for work done "at the behest of the Trump Organization". The 52-year-old will begin a three-year prison sentence in May for the campaign finance violation of paying hush money to one of Mr Trump's alleged mistresses, as well as convictions for tax evasion and lying to Congress. Cohen last week gave dramatic testimony to the US Congressional House Oversight Committee about the president, during which he accused him of being a "racist", "conman" and a "cheat". The president has turned on Mr Cohen, who was his personal lawyer and fixer for approximately a decade, and accused him of lying. Mr Cohen's lawsuit, filed in a Manhattan court, says he was involved in several court cases and legal proceedings - including Mr Mueller's Russia investigation. 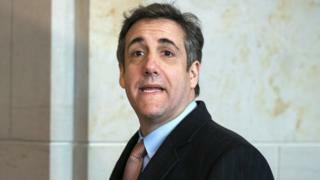 Under an indemnification agreement Cohen allegedly signed with the Trump Organization in July 2017, the company agreed that it would pay all of Cohen's fees and costs in connection with cases related to the company. But despite written requests for reimbursement, the company has not paid him since May 2018, about the time Mr Cohen agreed to cooperate with the Special Counsel's investigation. Russia has denied interfering in the 2016 election, while President Trump has frequently criticised Mr Mueller's investigation into his campaign and its alleged links with Moscow.